← I can haz two colors? This entry was posted in Butterick, Crafting for others, Dresses, Fitting, Knitting, Sewing, Sweaters, TNT's, Work Wardrobe. Bookmark the permalink. I know its a pain, but rip out the dart stitches, the tedious work will be worth it. The other option is keep it as is and pair the dress with a cardigan or blazer. I think (sorry, my English is poor) the vertical slimming is too long. This is a very simple job, unstich a bit. Look the arch! If you don’t like it yet, unstich the horizontal sewing and take down that. It’s about 30 minutes and worth it. If you’d like to get more help, I’ll send a letter. I think you need your best (most uplifting) bra and everything might be well. Could there be more “turn of cloth” in this fabric? Different bra first, if that doesn’t work try the unpicking of the vertical dart suggestion. How is the lining hanging? With that kind of fabric I don’t think your stitching would show if you changed the darts to do their intended job. Are you wearing the same bra you’ve always worn? 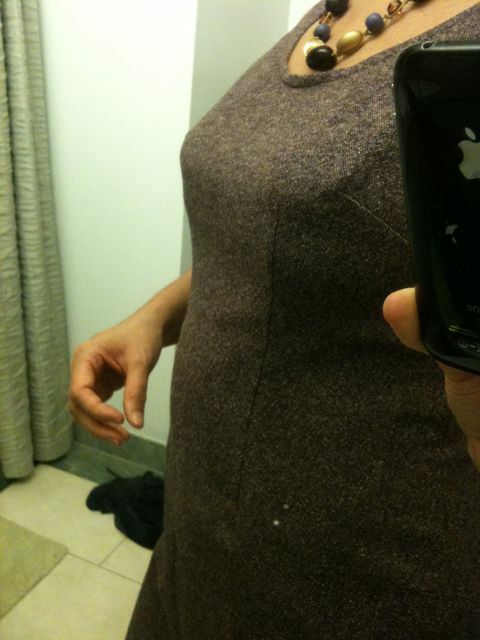 I am no pro, but here is my 2 cents worth…..I think the upper chest is very flattering and fits perfectly. I would release and baste that side dart just a tad lower, and then try it on again. I would also make a narrower side seam just in the bust area if it still feels too tight. Otherwise, I love the fabric and the fit on you. It doesn’t look as though it is outrageously pulled across your bustline, so just a little from the side seams should do it for you. Good luck!!! Oh no!! I would try a different bra, first, too. I days like that where something goes wrong and you think… I’ll just put that done and work on something else and then that something else is problematic, too. No fun!! I’m sure everything will work out in the end. Different bra and letting out the shoulder seam about 0,5 cm (if still possible) – that could do the trick, I think. I think the vertical dart should be released first. Maybe then you won’t have to change side seam? I have had the same nasty surpise with a TNT, less ease in certain fabrics. Can you release the bust dart and use a gathering like I see in some vintage patterns? I don’t know the drape of your material though. What about rummaging through your lingerie drawer and seeing if the jumper works with another brassiere? If you are going to lower the darts, why not decrease them just a hair for more ease? Just brainstorming. Can’t wait to see the final fix. I’d start by restiching the vertical fisheye darts. Shorter, and thinner. That alone might be all that you need to do. And then if you wish to move the side dart lower, fine..
A fabric much firmer than usual may be the root cause of the problem? or much thicker? If your fabric is thick, you need to add some ease to deal with that specifically.. next time :-). PS; thicker fabric -and- lining, there you go! I screwed up my last jacket by making the size that was perfect unlined.. I agree with trying to another 1/2 on the shoulder seams. That should fix it – I am having the same problem with some alterations I may just recently. Ugg, on my third muslin (bodice only). Oh Boo. I can’t wait to see how you solve this sewing conundrum.